Hydraulic knockout punch kits enable you to easily and quickly punch holes through a variety of tough surfaces, including steel, with their hydraulic rams (Source). These are great tools if you are sick of traditional wrench-style punches- these hydraulic upgrades can do knockout punches 10x as fast, manufacturers claim. 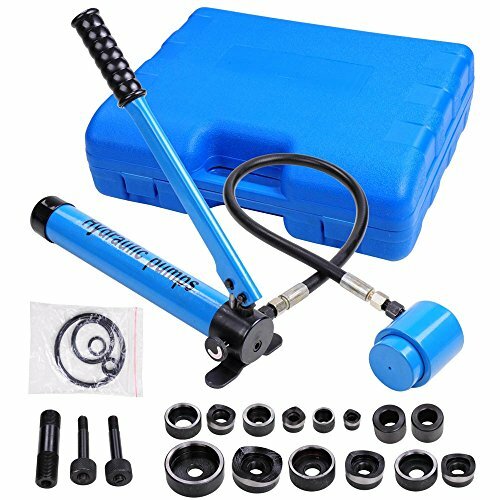 The 45 lb., Greenlee hydraulic hand pump knockout kit is our top pick- it is fairly expensive, but has received solid user feedback for its power and ease of operation. It features an 11 ton hydraulic ram enabling you to safely punch holes in plastic, aluminum, fiberglass and steel that is up to 10-gauge. It ships with: 6 slug buster knockouts, 10 dies, 3 spacers, 4 standard knockouts, 2 draw-stud adapters (including an adapter), a step bit, the 767 hydraulic hand pump, the 746 ram, a sturdy steel carrying case, and a three-foot high-pressure hose. This particular ram and hydraulic hand pump driver kit is intended for use on construction sites and for serious service professionals. This includes industrial electricians who need a professional way to punch holes through a variety of surface materials, and a means of performing both standard and slug buster knockouts. Buyers described using these knockout punch driver kits for the repair and installation of wire pipeline, servicing electronics, applications within chemical industries, machinery and ship-building repair, as well as metallurgy and petrol applications. Let's take a look at five of the best-selling hydraulic knockout kits on the market today and see how they compare. The Yescom 10 Ton Hydraulic Knockout Kit is a complete hydraulic knockout punch set that many users endorse because it can be used to complete a variety of different projects and suits a variety of different needs in the home or workplace. 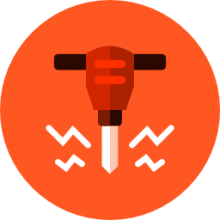 One of the features that a lot of buyers enjoy is that it has an on and off switch that you can rotate making it a lot safer to use than units that don’t have this feature. Users also endorse their versatility. For example, it can help you install and repair wire pipeline, can be used for metallurgy, electronics, repairing electrical appliances and anything from the chemical industry to working with a wide variety of machinery. Reviewers also appreciate that it has an easy seating with its own brackets on the bottom of its hydraulic pump. As well, this hydraulic knockout punch set has two heavy duty clasps to make sure that the kit locks firmly. Users also like that this hydraulic knockout punch set is easy to use and operates pretty quickly, saving time and energy. Some users did say they had trouble getting everything to fit back into the carry/storage case once they were removed. 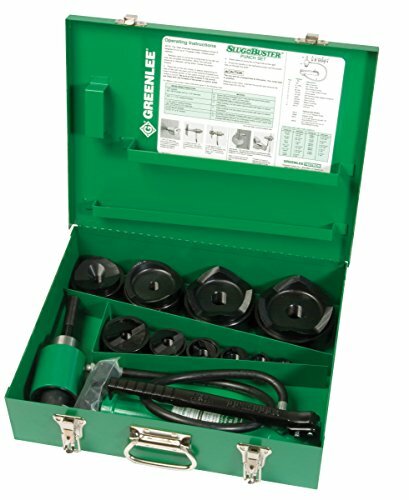 The Greenlee 7310SB Hydraulic Driver Kit is a compact hydraulic knockout punch set that has been sturdily designed for use on construction sites, as well as for a variety of service maintenance applications. Reviewers also like that this hydraulic knockout punch set can punch ten times faster than traditional wrench method- so it makes the job at hand a lot easier to get done quickly. Buyers, whether industrial electricians or professional woodworkers, endorse the versatility of this hydraulic knockout punch- saying that it works under a variety of conditions and on different projects. They also enjoyed the lightweight, yet powerful, hydraulic pump and ram that comes with this hydraulic knockout punch set- saying that it makes work easier and quicker. No matter where they might be- whether it’s on a construction site or in their own workshops at home. Some users didn’t really like the price tag- some felt that it was a bit expensive. The L.H. Dottie kit is a hydraulic knockout punch set that offers a lot for the professional- with many electricians endorsing its smooth operation and ease of use. Reviewers not only like its relatively low price, but were pleasantly surprised with its quality construction. Those who have used this hydraulic knockout punch set like the good die selection- and how nice and clean the holes are cut. They also commend how easy this particular hydraulic knockout punch set is to use. Users have found that it is extremely durable and reliable- saying that it has lasted a long time under tough work conditions. The Yescom Hydraulic Knockout Punch Driver Kit is a hydraulic punch set that can be used by professionals as well as the home hobbyist in their workshop or garage. Reviewers like the fact that this unit just like the 10-ton version has an on/off switch that rotates for safety and that it has a nice plastic grip at the end of the units long steel handle making it easier and more comfortable to use. This hydraulic knockout punch set also has its own brackets for easy seating onto the bottom of its hydraulic pump and comes with two metal clasps that are strong enough to make sure the kit locks firmly. Buyers commend this hydraulic knockout punch for accommodating a diversity of materials- such as stainless steel, aluminum, steel, plastic, wood and more. Those who have used this hydraulic knockout punch set commented that they like the convenient carry/storage case that not only makes the unit easier to transport but helps protect the hydraulic knockout punch set. The Greenlee 7804SB Quick Draw Hydraulic Punch Driver and Kit has a lot of nice features- its compact and lightweight size, its quick draw driver with two draw studs, and robust accessories that include an adapter, a spacer, and a case. Users particularly endorse its lightweight size- saying that it is especially compact for transport to any job site. As well, it is fast and easy to operate- making it ideal for work or home use. They also endorse the speed of operation- its straight-on front panel punching is really effective, making it easy to do the punching even through 10 gauge stainless steel. This hydraulic knockout punch set can also be used with non-round punches, something users found to be a nice added feature. Another nice feature that comes with this hydraulic knockout punch set is that the punch driver has a nice flexible body and this allows users to be able to do hole punching in a variety of different angles, making work a lot easier and much quicker. Users especially like that the handle and release mechanisms of this hydraulic knockout punch set can rotate almost 360 degrees making work a lot easier. Some users say they didn’t get some of the dies as described but other than that there were no complaints about this product. When users were assessing their hydraulic driver punch sets, in general they were looking for tools that were simple and easy to operate in the field and on remote construction work-sites. Long-ram jacks were another hydraulic tool these service professionals endorse in their work-lives. One of the primary things reviewers prioritized was a compact and portable design so that the hydraulic punch kits could be transported to different locations as needed. 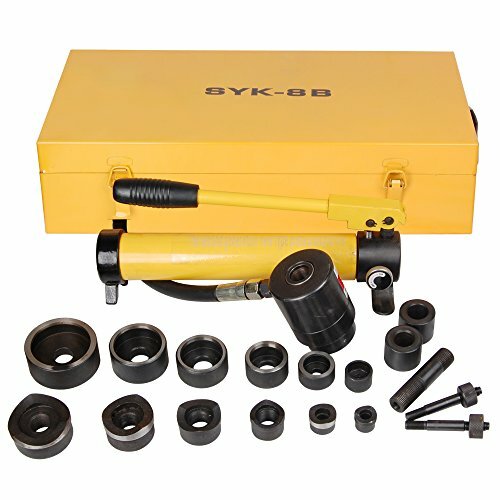 As well, these hydraulic punch kits, manufacturers claim, can punch up to 10x as fast as using the traditional wrench method- this is a boon for electricians and other industrial service technicians that require speed and precision when they are punching through metal another tough surface areas. 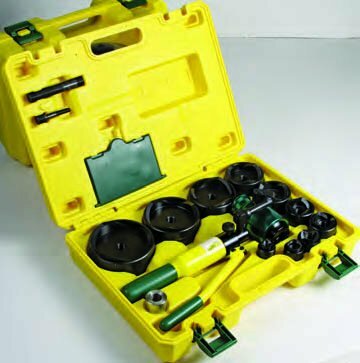 We have seen many reviewers using these hydraulic knockout kits on a variety of different construction and maintenance job sites, as well for residential repairs. If you are in the market for a hydraulic knockout punch driver kit- read our reviews above, examine the comparison table, and click through to individual product pages to scrutinize the exact specifications to ensure you purchase the best quality option for you and your service needs.